HUGE! 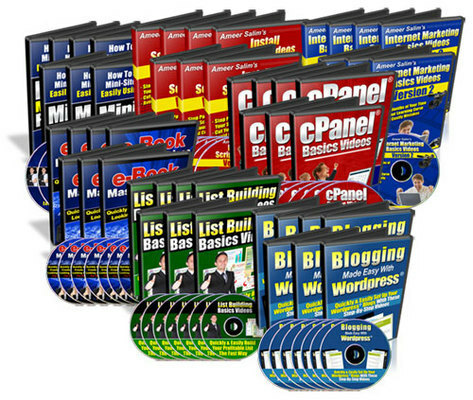 7 Brand New video Tutorials Package for 2009!!! cPanel® is currently the most popular & user-friendly control panel for web hosting accounts, period! However, most newbies do not have a clue on how to use them. It could take you hours trying to figure out how to use the features. But instead of knocking yourself out trying to search with just the right learning tools, you can now have an entire collection of my hard-hitting online video tutorials for your, ready at your beck and call. Do you know that when you're starting out on an Internet business, you will come across A LOT of new challenges that are RARELY being told by most people? Step-by-step guides are a good way to start and that really cut down on your learning curves. Most marketing manuals teach you WHAT to do instead of showing you "How To Do"
So, I decided that I was going to put together a series of online videos to help newbies cut their learning curve drastically and eventually get their own Internet business up and running a whole lot faster and easier. Suppose you could learn detailed step-by-step video tutorials on how to get your own Wordpress® blog installed and running on your server. Creating a website from scratch is one of the most difficult tasks that you might encounter when trying to make a living online. You can either start learning by reading "hard-to-read" manuals and ebooks or even hire a website designer who commands a very high fee to get your website created. But now all those are just a thing of the past. I've assembled a series of coaching video tutorials that show you every single step in my minisite creation. And - it doesn't matter if you've never created a web page before, I'll show you every single step from scratch. Suppose you could learn detailed step-by-step video tutorials on how to create your own profitable list. And you've probably heard the phrase 'the money is in the list'. Without doubt, having a mailing list of your own is a goldmine. You can make 'money-on-demand' anytime you want by sending a one simple email to all your subscribers. But it could take you years and can cost you a small fortune to figure out how to do that. So instead of knocking yourself out trying to come up with just the right learning tools, you can now have an entire collection of my hard-hitting online video tutorials for your, ready at your beck and call. Suppose you could learn detailed step-by-step video tutorials on how to create your own e-Books.